The X-22A was the Navy contracted and managed portion of the Tri-Service Assault Transport Program. The Bell X-22A was 39 ft long, featured side-by-side pilot seats, and had a gross weight of 17,000, including six passengers or a 1,200 lb payload. It was powered by four 1,250 shp GE YT58-GE-8D turboshaft engines that were cross-linked and had 35% excess power in case one of the engines failed in hover. Span over the canard (including the 7 ft diameter three-bladed ducted propellers) was 23 ft; across the rear wingtip ducts it was 39 ft. The ducts rotated non-differentially from 0° to 95° and had spanwise elevons across the center of the duct. Differential propeller pitch and the elevons were used to control the X-22A in hover. In forward flight, the ducts provided a significant amount of the aerodynamic lift. The first aircraft was rolled out on 25 May 1965. It made its first hovering flight in March 1966, and was tested to transition angles of up to 30° at speeds of up to 100 kt. That August, the first prototype was lost in a hard landing after only three hours of flying time due to a hydraulic failure. 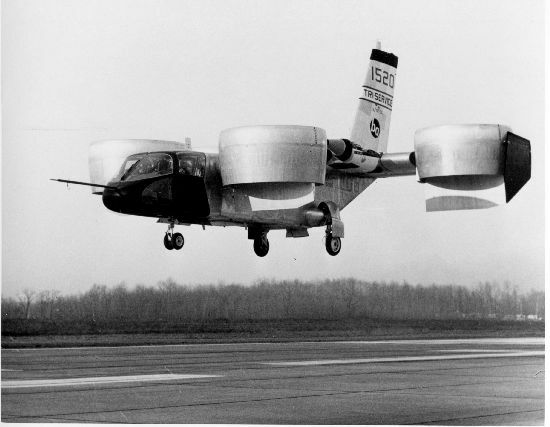 The second prototype made its first flight in January 1967 and performed hundreds of complete transitions. It reached a maximum speed in forward flight of 315 mph, and had a range of 450 miles. In early 1968, the X-22A's variable stability and control system was demonstrated, which allowed for research into hover and transition flight characteristics of other possible V/STOL aircraft. On 30 July 1968, it set a record by hovering at an altitude of over 8,000 ft. Flying until 1988, it accrued about 200 hours in the air. A video of the aircraft in flight can be see on the VFS Helicopter History Facebook site. Resources related to the X-22A , provided by the Vertical Flight Society. Resources related to the X-22A , provided by public sources across the internet.